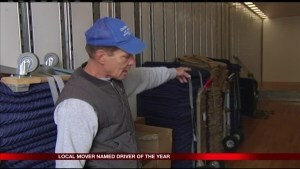 ERIE, Pa. — Moving to a new home can be a stressful experience, but it helps when you have an award-winning mover. Joe Nason, of J.H. Bennett Moving and Storage in Erie, was given the Pennsylvania Moving & Storage Associates award for 2016 Driver of the Year at the annual conference dinner held in Grantville in early October. Nason, who has been with the moving company since 1986, is known for his customer service. The award is based on the driver’s years of safe driving, attention to detail, heroism and acts of courtesy. Copyright 2016 Nexstar Broadcasting, Inc. All rights reserved. This material may not be published, broadcast, rewritten, or redistributed. I have moved twice with JH Bennett in the past two years, the most recent in July from Aurora, OH to Salem, VA. From the folks in the office to the men who did the actual move: all were professional, helpful, caring, efficient, witty, and wonderful to work with. They made a very stressful event/time as easy as is possible. If you are looking for a company that cares about you as well as your possessions and their job, then I recommend JH Bennett with complete confidence and much gratitude.